The main trailhead in Proud Lake Recreation Area is located in the large day-use parking area just down the road from the park headquarters and near the organization campground. But this loop begins at fishing access site where Wixom Road crosses the Huron River and includes the River Trail. Although not often shown on maps, this path is by far the most scenic one in the park and is the only one that allows you to hike along the Huron River. 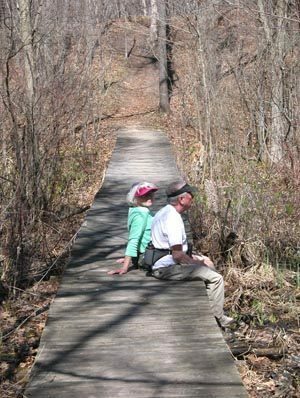 The trail winds through extensive wetlands and the park staff is constantly working to maintain its many boardwalks and bridges. Check on the trail’s status and plan to get your boots wet. River trail is an interesting hike any time of the year but particularly in the spring when the Huron River is stocked with full-size rainbow and brown trout in a program to introduce anglers to fly fishing. 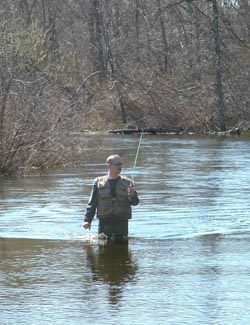 Fishing is catch-and-release, flies-only from Wixom Road to Moss Lake in April and hikers will not only see the graceful casts of fly anglers but the trout as well. At this time of the year the Huron River has the clarity of a trout stream in northern Michigan and it’s easy to spot the 10 to 25-inch long rainbows and browns in the current. Overall this hike is an easy trek through the vast wetlands and rolling wooded terrain that make up most of this state park. If you begin and end from the main trailhead in the day-use parking lot, the loop is reduced to a 4.8 miles. From the parking lot in the fishing access site, a trail departs east into the woods and begins by hugging the Huron River for a quarter mile. In April the anglers seen here are using flies and wading through the gentle current. Later in the summer they are often casing spinners in hopes of catching smallmouth bass. Within a quarter mile you arrive at a dock in the Huron River and a shelter where the trail swings inland to a vault toilet and a posted spur trail to the Pines Organization Campground. Continue east (left) and in another quarter mile you pass a posted junction to the day-use parking area. Stay with the main trail (left) and the next stretch is fascinating, a series of bridges and boardwalks through a wooded wetland where in the spring wildflowers are popping up everywhere. Within a mile from the start River Trail arrives at Chief Pontiac Trail, a wide path, marked by a variety of colors (red, blue, green, orange) and featuring a handful of interpretive displays. 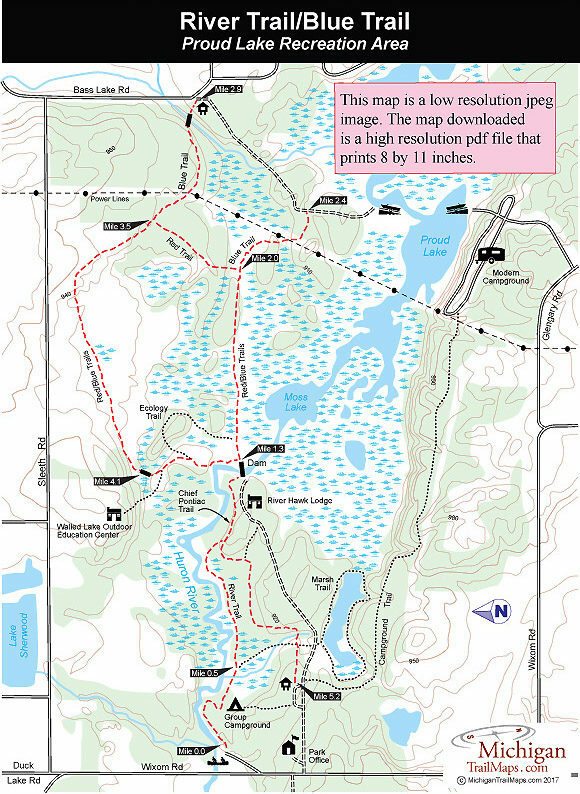 Continue east (left) and at Mile 1.2 you’ll return to the banks of the Huron River where there is a picnic table and then the Huron River Dam that forms Moss Lake. Usually closed off to vehicle traffic, the dam makes for a very scenic spot,. A large foot bridge arches across the Huron River and from the middle of it you can see the massive cattail marshes that surround Moss Lake. This is also where the trout are released and throughout much of April you can see hundreds of them in the pools just below the dam and usually an angler or two trying to entice them with streamers and nymphs. On the east side of the bridge you continue east on the Red/Blue Trails. Stay right at the next two junctions; the first being where the loop returns and the second where the Ecology Trail splits off. Your trail moves through more wetlands but stays surprisingly dry and at Mile 2 arrives at the junction where the Red Trail splits off to the north. The Blue Trail continues east and is well marked. Within a quarter mile it climbs into an open area to pass underneath a set of power lines and at Mile 2.4 arrives at the dirt access road to a boat launch on Proud Lake. Head north (left) on the well-graded road for almost a half mile to a yellow gate near the corner of Bass Lake Road. The gate at Mile 2.9 marks where the Blue Trail resumes by heading west into the park. You immediately descend to a foot bridge across a stream and then briefly follow a low ridgeline above the wet area the creek creates. At Mile 3.3 you pass back underneath the power lines and at Mile 3.5 arrive at the posted junction with the red trail. Continue west (right) if you want to avoid backtracking. The loop immediately crosses another bridge over a stream and then sidles a wetland for a spell. Here the trail winds through an infusion of horsetails, the primitive perennial plant with dark-green hollow segmented stems but no true leaves. Usually found near standing water or wet areas, horsetail stems have sand embedded in their tissue and were often used by early American settlers for scouring pots and pans. This gritty texture gives the plant its common name; "scouring rush". At Mile 3.9 you arrive at the corner of a fallow field and step over what appears to be a old stone fence. The trail quickly snakes back into the woods and within a quarter mile swings south to cross a wetland area on a long boardwalk. You climb out the other side to a posted junction. If you head west (right) within 0.3 mile you’d climb a ridge to the Walled Lake Outdoor Education Center, a large complex whose rope course and zip line are impressive. The Red/Blue Trails continue in a southerly direction (left) to quickly pass the posted Ecology Trail and then skirt the Huron River along a boardwalk before arriving back at the dam at Mile 4.5. Re-cross the foot bridge and backtrack along the Chief Pontiac Trail, this time following it all the way to emerge in the main trailhead parking area at Mile 5.2. The easiest way to return to the Wixom Road access site is to hike to the organization campground and then head west on the River Trail for the final half mile of this hike.